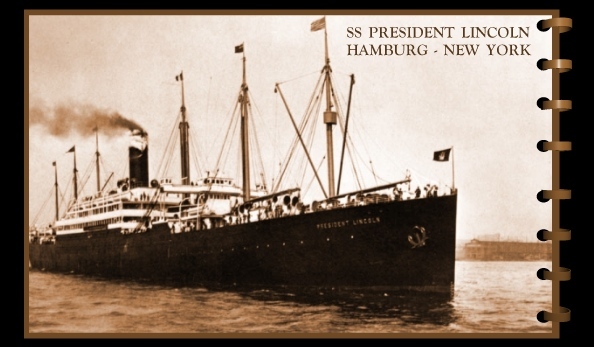 Charles and Salome (Selma) Stoeckel made a voyage on the SS President Lincoln in August of 1912, departing from the Port of Hamburg. They had become naturalized citizens of the United States much earlier [ 17 October 1893 ], so this voyage was not their first. 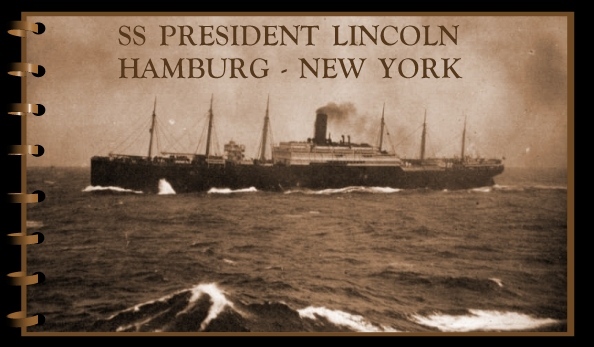 The SS President Lincoln's top speed was 14 knots. She could accommodate 202 passengers in 1st class, 153 in 2nd class, 788 in 3rd class, and 2,300 in 4th class (steerage.) Steerage was a single, common area in the lowest part of the ship. It offered no privacy -- everyone ate and slept in the same shared space. There were sometimes a limited number of cots available for sleeping, and a few tables from which to eat, but not enough for everyone. Passengers in steerage often ate and slept on the hard wood plank floor. This would be their designated place for the duration of the voyage. There were no portholes to let in fresh air or sunshine, and the ability to stroll along the upper deck was a privilege, typically reserved for only first class passengers. Unlike today's passenger ships, these ships were not equipped with things such as stabilizers to help ensure a smooth ride. Nor did they have the technology to forecast weather conditions accurately. So ship captains kept detailed logs of each voyage, making note of such things as the position and size of icebergs, and any weather trends they encountered. Upon reaching port, they would share that information with the captains of other ships. Imagine what it may have been like for our ancestors, as they bounced and pitched across the high seas on their way to a new and unfamiliar land. During severe storms, all passengers would be locked away below decks or in the relative safety of their staterooms. But there was no outside ventilation, no light, and no way to cook during those times -- conditions they may have had to endure for days at a time. When death occurred during a voyage, the only option was to commit the body to the sea.